On Saturday 24th December (Christmas Eve) there will be no Mass in the morning as we will be celebrating the First Mass of Christmas at eight o’clock in the evening on that day. The church was packed as together we celebrated in song and prayer the imminent arrival of the Saviour of the world as a new born baby in a stable. We have all sung these Carols so many times yet their words and sentiments still bring a lump to the throat each time that we sing them together. Father Croft and Canon Denby, resplendent in gold copes, led us in the service of Carols interspersed with the traditional readings that take us through the Incarnation story that we know so well. We were also delighted as children from our school choir entertained us with the “Little Drummer Boy” and items from their own Nativity Play “Away in a Manger”. The Christmas Spirit was fortified after the event with mince pies and mulled wine. The Sunday morning started as normal with a High Mass at 11.00am, with Father Mark Brackley as Celebrant, assisted ably by Father Croft and Canon Denby. As proceedings drew to a close Joe and Phyllis slid out early to head off to the Red Hall Restaurant to make final preparations for the big event. 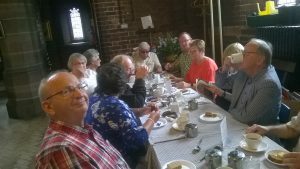 Margaret Finch had coordinated an excellent meal for 70 persons; clergy, members of our congregation and friends of St Hilda’s. After the meal all conversation stopped as we hunted for raffle tickets. Fr Croft did his best to ensure that the stubs were well stirred and that, as he was reminded by Irene, he didn’t just take them off the top. The £100 was won by Harry March and the £50 by Marion. The Raffle raised a grand total of £654. We are very grateful for the generosity of all those who donated prizes. A special presentation then followed. Father Mark has been a great asset to St Hilda’s for many years ; coming in to assist at Mass every month and providing support and encouragement to Fr Croft. As he had now decided to retire a collection was made for him in the Parish and Father Croft was delighted to give him vouchers for £120 to spend on whatever took his fancy. 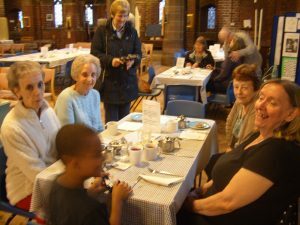 The Big Breakfast has become a tradition at St Hilda’s. It is the brainchild of Phyllis, who buys all the ingredients and who oversees all the proceedings in the kitchen. We now welcome not only hungry souls from our own community but also friends from further afield. Diners have a choice of either the Full Monty, 9 items which fill an extra large plate, or a pick and mix selection according to taste (or appetite). On Saturday a total of 26 friends of St Hilda’s breakfasted on bacon, eggs, sausages, fried bread, baked beans, black pudding and mushrooms. This enjoyable occasion raised £160 towards church funds. Tripping the Light Fantastic! An evening of music, dancing and top class refreshments. Alfie entertained us with a selection of well known tunes and all joined in the fun with spot prizes and rolling the lemon. 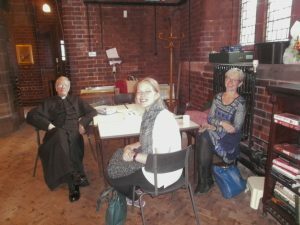 £406 for church funds! Well done to the organisers and a thank you to the helpers. How close is the lemon? A very successful event. We opened our doors to the local community and welcomed many neighbours for whom this was the first time that they had crossed the threshold. 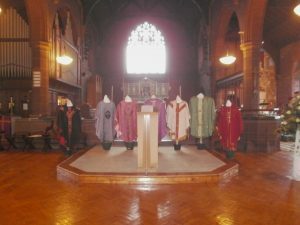 The church year in vestments! A wonderful event. 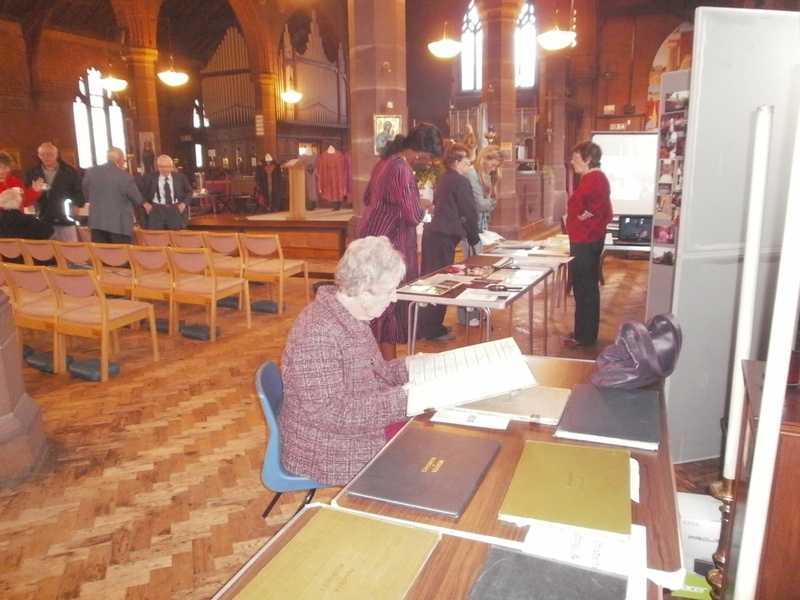 The doors opened at 10am and from then until 12noon the church was buzzing! It was one of the most successful fairs in recent times. 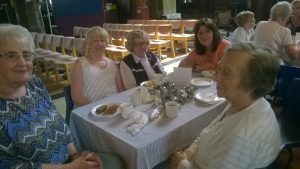 We raised a total of £1184.50 for church funds. A big thank you to everyone for their various contributions. This year we celebrated our Patronal Festival on the day itself and not as in previous years on the nearest Sunday. The Celebrant was Fr Croft who was assisted by Canon Denby, Fr Sutton and Canon Ian Anthony, who also preached the sermon. There were other clergy in the congregation and we were also delighted to welcome visitors from far and wide who came to celebrate with us. The choir from our Primary School was with us and provided a beautiful counterpoint to the traditional Liturgy, performing three numbers immediately after the sermon. The children’s choir master, Mark Derbyshire, was prevailed upon at very short notice to reinforce our little church choir. This was greatly appreciated. The refrain of Faith of our Fathers lifted the roof and our spirits as we processed away from the Sanctuary. I am almost sure that through the clouds of incense I detected a smile hovering on the lips of the statue of the stern Abbess, our patroness Hilda of Whitby, who keeps watch over us during our devotions. The evening concluded with a wonderful buffet provided by the parishioners. 5 Roseland Drive was bursting at the seams on Saturday night. All who came were royally entertained to a sumptuous buffet and the drink ( non alcoholic for the drivers) flowed freely. The evening was rounded off with the customary raffle, accompanied by the usual cry of “shake them up” from those who weren’t winning. 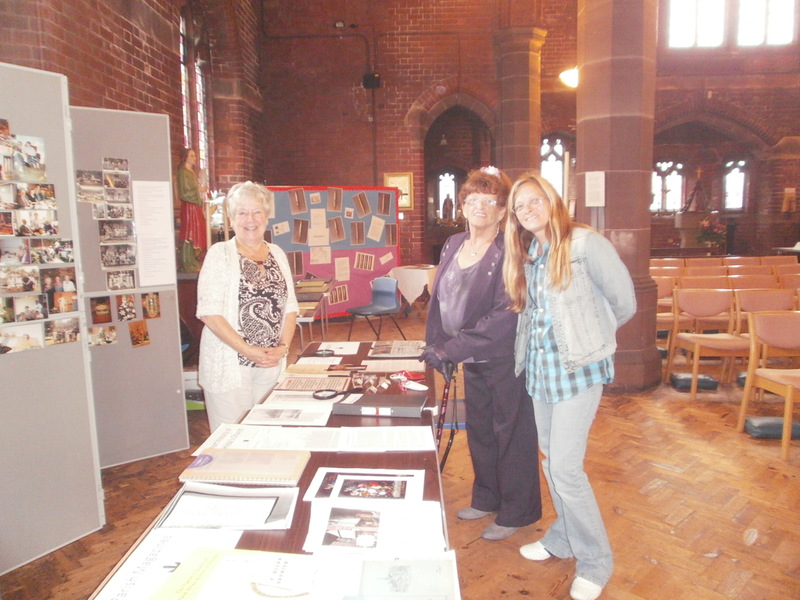 The event raised a wonderful total of £380 towards church funds.